If you wonder about the best time of day or night to send emails, Send Time Optimization can take out the guesswork. Send Time Optimization uses data science to determine when your contacts are most likely to engage, and sends it then. In this article, you’ll learn how to use Send Time Optimization. This is a paid account feature and is included with all Pay As You Go, Monthly, Pro, and High Volume Plans. Send Time Optimization can be used on Mailchimp’s regular, plain-text, A/B testing, and multivariate email types. Automations are not included. We don’t recommend this feature for same-day sending. This feature can only be used if there are more than five hours left in the day in the time zone set for the account. Mailchimp users send a lot of email to a lot of people. Some of those people receive emails from more than one Mailchimp user, which means we have some data about their individual engagement patterns. When you create an email and turn on Send Time Optimization, we’ll use this data to pinpoint an ideal time within 24 hours of your selected send date, and send your campaign at that time. Learn about the science of Send Time Optimization. To use Send Time Optimization on your regular, plain-text, or A/B testing email campaign, follow these steps. When your campaign is ready to send, click Schedule. 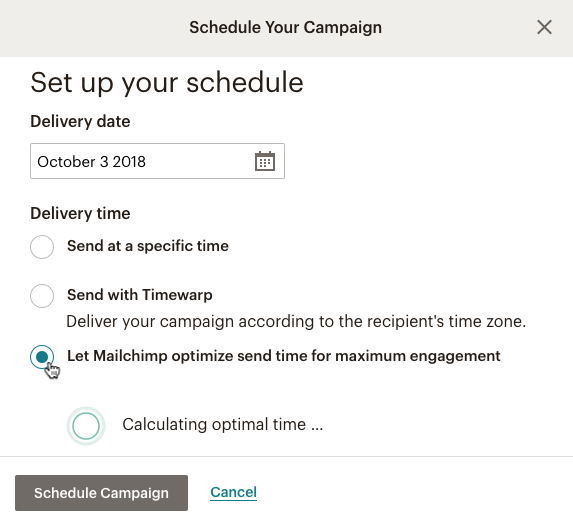 Choose Let Mailchimp optimize send time for maximum engagement. Learn how to send, schedule, pause a campaign, and other options.